The Fish Islands off the coast of Darien, CT are the summer home to a very remarkable individual; an American Oystercatcher. Not only is this bird very striking with a penguin like black and white feather pattern and brilliant long red bill but it also has two red leg bands with the unique code “F3” (Red F3). The color leg bands with their unique alphanumeric code enable this individual to be distinguished from other oystercatchers allowing its’ yearly movements to be tracked. What is especially remarkable about Red F3 is where it overwinters. This individual has been re-sighted wintering in Nicaragua’s Delta Del Estero on the Pacific coast for the past three winters! This is a 2,000 – 2,500 mile trip from Connecticut down to Nicaragua every fall and back again in the spring to nest on the Fish Islands in Darien. Previously, it was not known how far south oystercatchers migrated each winter but now thanks to the hard work of Quetzalli Nicaragua Team we now know where Red F3 winters. The Quetzalli Team is a small nonprofit in Nicaragua who conducts most of the countries shorebird conservation work. They have reported about 80 oystercatchers in the Gulf of Fonseca off Nicaragua during the past three winters, some of which were wearing color leg bands from our Atlantic coast states, including Red F3. Color banding American Oystercatchers is a collaborative project along the Atlantic coast to help researchers learn about migration patterns, survival rates and habitat requirements. The color of the band corresponds to the state the individual was banded. For example, red bands are used in Georgia, green bands in Virginia, and now yellow in Connecticut. The success of the project is dependent on the public, researchers and other observers reporting banded bird sightings. 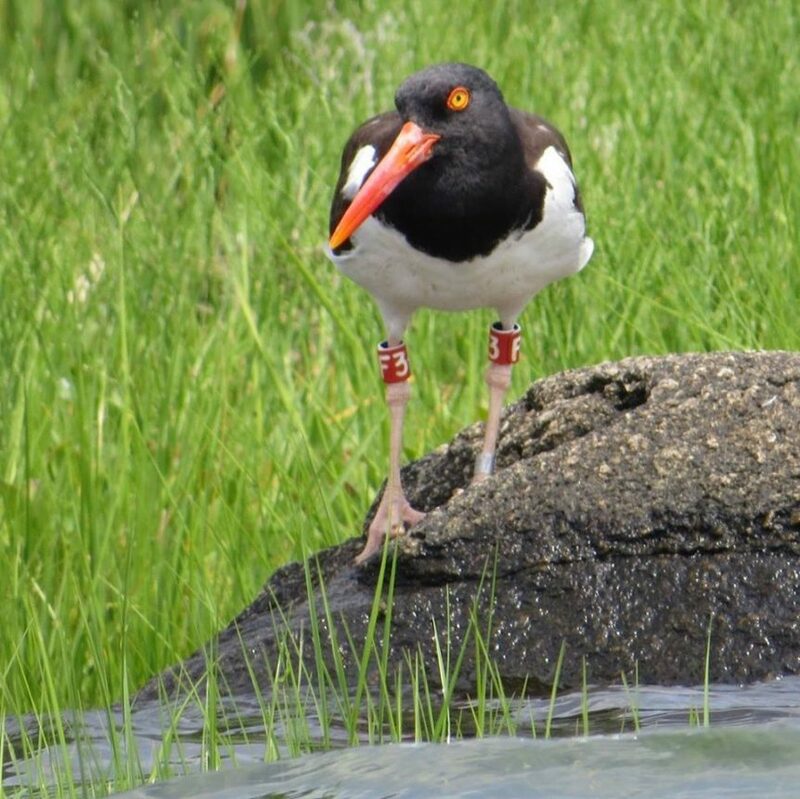 The American Oystercatcher Working Group maintains a database of all reported sightings collected from researchers and from data submitted through the online report form on their website (amoywg.org). Reported sightings provide critical data that will improve our knowledge of the ecology of oystercatchers and help advance the conservation of this vulnerable species. The American Oystercatcher is at risk due to low population size, limited habitat availability, and vulnerability to climate change and disturbance. The story of Red F3 is important as it helps highlight specific habitats crucial to migration that span across the Americas. Red F3 was originally banded in Georgia along the Altamaha Sound in 2005. It was first reported nesting in the Fish Islands area in 2011 and has returned every spring. We now know it overwinters in Nicaragua, which completes the migration route of this remarkable individual. With a better understanding of the movement patterns of this species and through collaborative partnerships between many organizations, researchers can shape management plans and conservation efforts to ensure the survival of these extraordinary birds. Read more about Audubon’s banding program here.